My farrier and I were at a Christmas party hosted by a mutual friend and he asked me if I knew of anyone looking for a horse to use for fox hunting. He had a really nice off the track thoroughbred that was just too tall for polo. His sport of choice being polo, he wasn’t interested in keeping a 16.1hh gelding. I was, of course, not interested but would accept some pictures so I could share the information with my fox hunting buddies. Unfortunately I was nearly immediately smitten. Zapper was every girl’s dream: tall, dark and very handsome! After Jaguar’s disappointing diagnosis last summer and his being unrideable, I borrowed a horse from my Mom for this hunt season. I have known all season the regardless of how much I loved Casey, he would have to go back to Montana at the conclusion of hunt season for Mom to show him. I had it in my head that I might hunt Coco next year, but she’s got the most value in the show ring so I don’t think it would be in her best interest to join the hunt field until she is older and a bit more seasoned. Without thinking about it too much I went ahead and scheduled to go see “Zapper” with my horsey bestie. 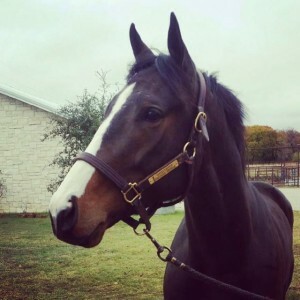 Zapper’s last race was November 26 and we went to ride him on January 2. Keep in mind that means he had been off the track for barely 45 days! Here is a link to a video of when we tried Zapper. He had some leg injuries from some pasture shenanigans and was probably a bit sore from the track, but he is a lovely mover. We were extremely impressed by his disposition. It took a LOT of leg to get him to go forward. He didn’t look at anything. He tolerated us jumping on him from the ground. My farrier rode him first in a big western saddle with smooth rowelled spurs and Zapper showed no care. The hunt I whip for is not a fast and forward hunt, so requires a horse that can go forward over rough terrain just as well as it can stand still and await direction. Zapper showed strong propensity for the standing still part. I scheduled my vet to do a pre-purchase exam a couple days later and after positive feedback, took him home within the week. Just what I needed, another horse! The first couple weeks required some care and medications for his pasture injuries and there will be a few more vet visits for the broken tooth, but I have a good feeling about him. 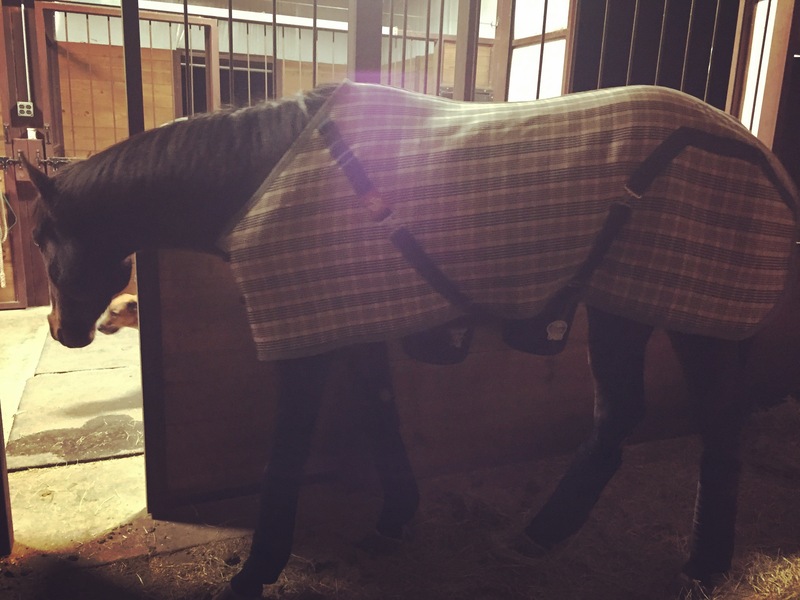 Simon snug in his blanket and and all wrapped up in his Back on Track wraps. He is extremely easy to have around. I wrap his legs and give him meds without even putting on his halter! He is calmer than the other four at home by far. I’ll give him the month of January completely off and start hacking him a bit in February. 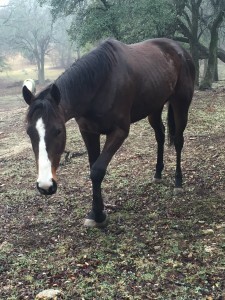 I hope to ride him at at least one or two hunts in March, just to see how he does out and about and hoping he remains as calm and quiet as his disposition indicates. Like I said, just what I needed was another horse. I changed his name to Simon. Zapper reminds me of a bug zapper so he is named for the ghost in Oscar Wilde’s The Canterville Ghost. If he ever requires a show name it will be The Canterville Ghost. Simon the pasture puff. Still sporting his off-the-track bod. The next few months will be full of grass hay, Ultium and whatever it takes to pack on some lbs.